I had a nice perky, getting ready for Easter post all planned to write out yesterday. And I had the whole day set aside to get all my basket-related tasks completed. But as the day unfolded, I felt nothing like perky for quite a few hours. And I thought that maybe I could write a more helpful post, if I talked about pulling myself together, when life kept throwing me curve balls. I know that reading of other women's daily struggles really does helps me. It was just one of those days, when I felt like I was solving one crisis after another. These weren't serious problems, but it was the repeated dealing with problems that wore me down. Truly, I felt like crying. It was that bad. I was tired, and that just skewed how I was seeing every difficulty, I am sure. I wanted to cry. I wanted a big, strong man to come along and tell me, "there, there little lady. Don't you worry your pretty little head over this. I'll take care of everything." I didn't want to have to fix one more thing. Sometimes, I resent being so capable. If I see something needs fixing, I know that I should at least give it a serious try. I sometimes wish I were more helpless. But this is how I've been made, a capable woman. Oh, I can't fix everything. But the things that I know my mother or grandmother would have let a man take care of, I feel like eyes are on me, in our house, to at least try to fix. It was when I was standing on a rickety ladder, under the broken downspout of the rain gutter, with icy water pouring out onto my head, shoulder and leg, as the snow was melting on the roof, that I felt the most resentment for being capable. We have had several nights of wind, followed by rain and snow. The wind knocked the drain pipe to the gutter off in two places. And now, rapidly melting snow was pouring down the corner of the house, along the siding and up against the foundation. I had mentioned the disconnected downspout to my husband a couple of nights ago. But I knew he wouldn't get to it until the weekend. And so, being a capable woman, it fell on me to fix this right then and there, before I went out to run my errands. I hope I did a great job and this won't come apart any time soon. I used pliers and a mallet to get that thing back together, and attached to the gutter. My hands were numb with cold when I finished, and my shoe is still drying out today. But it's fixed and I moved on. After a change of clothes and shoes, I was in the car, running my errands, and thinking about how I respond to these difficult days. While crying would sure feel good, I get a better feeling from continuing on with the day, and ticking more items off of my to-do list. Bad days are a fixture in this life. I can't change that. But I can trudge on, despite them. I may not be cheerful when I start in on my to-do list, on a day like yesterday. But as I get more and more done, despite a rocky start to the day, I feel my spirits cheered a little. I feel productive. The day was not lost to the problems which came about. 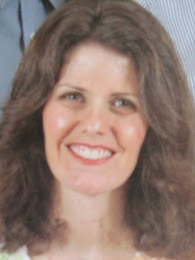 So, after a good pep talk, and consuming a lot of my children's Easter candy (okay, I hear your thoughts "what a bad mother, eating her kids' candy"-- let she who has not eaten any of her children's Easter, Christmas or Hallowe'en candy cast that first stone), I got to the day's tasks. 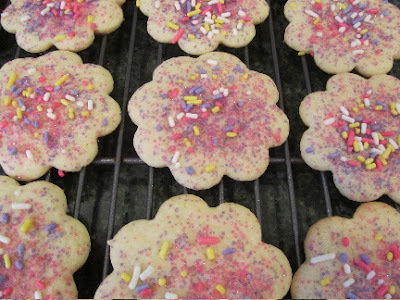 I baked the sugar cookies that I need to take to our church's coffee hour this Sunday. I did my bunny-work for the kids' Easter baskets. I got the baskets out, divided the candy, filled plastic eggs, went shopping for a couple of gifts for the baskets, then tied with ribbon, and I washed the Easter grass. Yes, you read that right, I washed the Easter grass. We are still using the original bag of Easter grass that I bought when my son was a baby, 25 years ago. I wash it a few days before Easter, oh, about every 2 or 3 years. It's the plastic kind of grass. I think I paid about 33 cents for the whole bag of it. I've vacuumed up a fair amount of it over the years, but we still have barely enough for 3 kids' baskets. 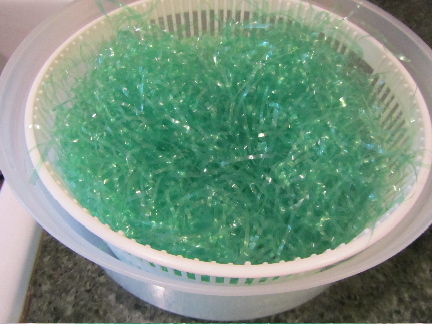 To wash the plastic Easter grass, I place it in the basket of my salad spinner. 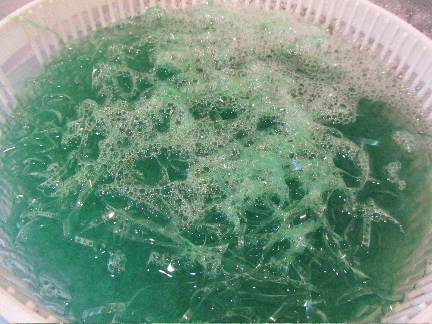 I add warm soapy water. Swish around with my hands for a minute. I drain, rinse, and spin out. I transfer the grass to a colander and allow to air dry for 1 day. I'm good to go, with dust-free Easter grass. We have allergies in this house, so I am careful to keep dust to a minimum. With making this one bag of grass stretch for 3 baskets, I have a little trick to make it look like there's more. I crumple up paper to put in the bottom of each basket. Then I top with a thin layer of the grass in each basket. Sure, you can just go without the grass. It is an invented "need" anyway. But I like that it pushes all the contents of the basket up and makes it look more abundant. There are some good alternatives to the plastic commercial Easter grass, should you be starting this year fresh: shredded paper is good (if you have any colorful junk mail or school flyers, run these through your paper shredder), a colorful piece of cloth from your scrapbag (just crumple it up in the bottom of the basket, like if you were lining a dog bed with a favorite blanket), or wheat grass. Soak 1/2 cup (per basket) of hard winter wheat seeds in water overnight. Drain and sprout in a jar on it's side for 24 hours, rinse the seeds 3 times per day. 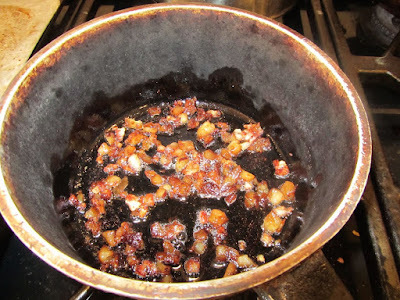 Give the dish and seeds a good watering, and cover the seeds with a piece of muslin to keep them from drying out). Every morning, for 3 days, lift the covering and water the seeds. Every evening, lift the cover and use a plant mister to mist the seeds. After 3 days, remove the cover and water daily. Keep out of direct sunlight. Depending on indoor temperature, wheat grass takes about 7-12 days to grow a nice bed of grass. The bonus to using wheat grass in your Easter baskets is you can then take cuttings to add to your smoothies. So, I did get most of my to-do's done for yesterday, even if the day wasn't one of my best. And I do feel good about that. How about you? How do you keep yourself from succumbing to horrendous pity when disasters keep popping up and you're the one who has to take care of them? I LOVE the Easter-Grass-Washing idea! Why didn't I ever think of that? Salad spinner & all. Thanks for your encouragement. There is comfort in numbers. Knowing that other women have difficult days, too (and sometimes lives), makes just handling things and moving on seem more do-able to me. Silly as this sounds, clean Easter grass makes me smile! All the women in my family are capable and independent, including me. It can be difficult & I completely understand. Don't worry about eating some Easter candy! (or Halloween candy or Christmas candy!) Hang in there! When I give it thought, I believe I would choose to be capable over helpless. It is better to be able to do things, than to have to wait on someone else all the time. It's just some days . . .
Now to keep myself from eating any more of the Easter candy! It was good, and it did help me get on with my day! Thanks for your kind words. You are a capable and "can-do-woman," what a great role model you are for your daughters. You are passing on a legacy to them that they will appreciated as they mature! I just hope you didn't re-injure yourself. Thank you for the "recipe" for wheat grass!! Thank you. I know in my heart that being able to fix things, and do for myself, without having to always nag someone else to help, is very valuable to our family, to my own self (it's good for my own ego to be able repair things), and as you say, a legacy to my daughters. I appreciate you pointing that out to me. I have been especially careful with my back. Thanks for your concern there. I would hate to really injure myself just as the gardening season is beginning. I would miss out on so much! Speaking of crying, I feel your pain. I felt like that yesterday. Thank goodness the feeling past. Hope it passes for you too. I'll be passing this Easter grass on to my grandkids, someday! This will become the family heirloom! LOL! It's funny, but it never occurred to me to throw it out. I am amazed that we haven't vacuumed more of it up over the years. Gosh, I'm sorry you had one of those days, too, yesterday. Those days can be hard to get through. As I accomplished more and more on my list, I felt better about my day. And thankfully, stuff stopped breaking down, burning out, and needing me to make extra trips all over town! Are you now on spring break? I bet you're enjoying every minute! Have a wonderful evening! I hear you loud and clear, Lili. Just came in from my first-ever snowblowing of our driveway. And it's a long one. Now to head out to do regular errands. Keep smiling and trudging ahead -- hopefully there's a lot more good days than bad days! Congratulations on the snowblowing! I'm sure that job is not at the top of your "want to do that again soon" list. But a job well done, nonetheless! I do think that when we accomplish these feats, that would normally be outside our area of focus, we need to give ourselves big pats on the back. There are women who will just throw up their hands in defeat, when faced with this sort of challenge. And then there are the rest of us. We have tough, pioneer spirit within us. And we should be proud of that fact. I do believe that there are more good days than bad. Here's wishing spring will arrive at your doorstep soon, and you won't have to use that snow blower very many more times this season! I just never thought to throw it out! I wonder what most households do with their Easter grass? But, yes, taking care of all of our things is a priority. To me, it just seems like the sensible thing to do. I am trying very hard to stay out of the Easter candy, now. I am certain that manufacturers are hoping for more people like me, to eat up half the Easter candy and "need" to buy more. Hope you're enjoying some of this fabulous NW sunshine this weekend! Just keep on keeping on. I've had a bad two years and can't always snap out of it. But everyday the sun comes up, the chickens need feeding and on my almost daily walks, I find some part of nature that thrills me. I know how you feel, we all do. Thank you so much for your encouragement! The sun does always come up (even when it's hidden behind the clouds). There is always a fresh start to the new day. I was never a morning person up until recently. But now, I am finding that I enjoy that fresh start to each day so much that rising early is not always the chore it used to be. There is always something better just around the corner. Getting outside is a big help for my spirit, too. Especially this time of year when there is something new popping up everywhere, a reminder of new beginnings and opportunities. It IS hard to be the go-to person. Good for you for diving into the Easter candy. Sometimes a sugar rush gets you through a tough moment. I'm sure your kids would agree! As for sugar rush, I don't know if this puts me in the good mom of the year category, or the really bad mom . . .
but when my oldest was 2 years old, and we'd be having a terrible two's sort of bad day, I would break out a box of cake mix. I would mix up the batter, bake most of it, and the two of us would sit on the kitchen floor together, with spoons and spatulas licking the rest of the batter out of the bowl (and I'd leave a generous amount in the bowl for us). Perhaps sugar, like in the form of Easter candy, should be considered medicinal! Several thoughts. I can feel that ice water now. Brrr. That must have been awful. And do you know what? I think it's okay for a can-do woman to cry. I think a little cry is a good thing. It releases stress. Hope today has been a better day. Enjoy the candy. I think you're right that it's okay to have a good cry every now and then. Fortunately, days are not always like the one I had, and the rest of the weekend was wonderful! Hope you had a good one, too! I do that too, think about what it would cost to hire out the repair. Sometimes that works to motivate me., especially if I think about what that extra money could do for our family. Chocolate does seem to be a big help! Oh my... I think we had the same day! Mine involved a cat food recall and some plumbing disasters that I still haven't quite resolved yet. I can totally relate to the feeling that being capable is a curse. It used to haunt me back when I was still working. It was like there would be some big crisis and everybody else had the luxury of just sitting around waiting for it to be fixed, but I always felt like it was my responsibility to do the fixing. I think it's one of my worst character flaws! I don't think I'd be tempted by kitty treats, either! LOL! I know that most everybody contributes in some way or other. But that would sure be annoying to be The One who everybody looked to to resolve issues at work! I hope you can get the plumbing situation taken care of soon. The candy does seem to do the trick! Good job on saving your Easter grass! I'm sure that even if that stuff does decompose, that it takes decades in a landfill. 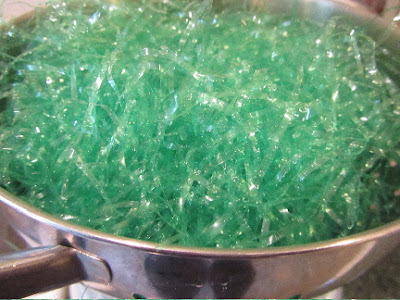 I'm sure it would be a startling statistic to find out, just how much Easter grass is sitting in landfills, when it could have been reused all these years. 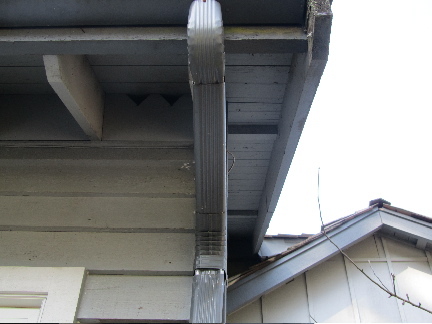 The gutters look solid enough and would last probably a while, but better get the husband to inspect and maybe reinforce it just in case.